When heavy rains lashed Nadi Toli village in Jharkhand in July this year, villagers were convinced that they would have to wait for another month before getting a toilet. The raw materials that were being transported from the capital, Ranchi to the village to construct toilets had to be left unattended 800 metres from the village. As it became nearly impossible for any vehicles to navigate through knee-deep waters, the panchayat officials and villagers took help of ‘behenge’, a conveyance system comprising bamboo with two baskets and delivered the materials on foot. The work resumed and within 15 days the village was declared open defecation free (ODF). One of the reasons behind Jharkhand’s relative success is the involvement of local communities and bodies such as women’s self-help groups. These communities and bodies have helped create awareness among residents; they have also monitored the toilet construction process. The state is also moving forward on putting in place better wastewater and solid waste management systems, the report stated. 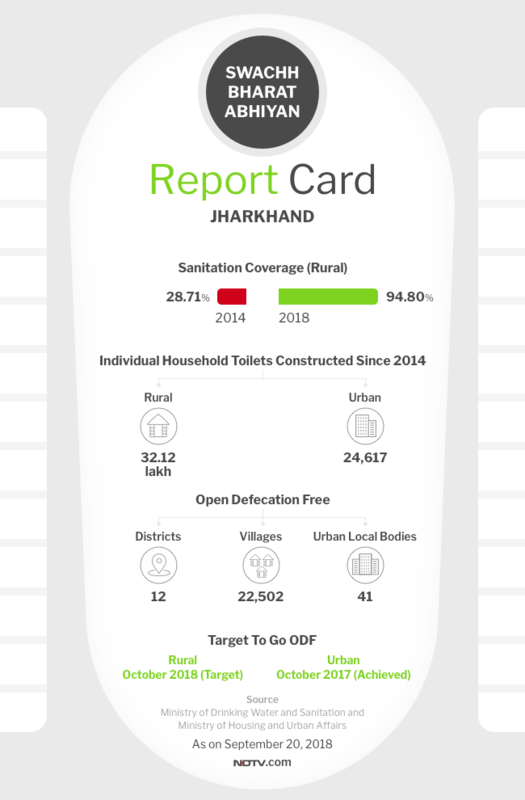 When Swachh Bharat Abhiyan was launched in 2014, merely 28 per cent of the villagers had access to toilet and today the coverage stands at whooping 94 per cent. However, when one looks at the ODF journey in the state it was rather slow in the beginning as its first district was declared ODF only after three years into the cleanliness mission. Ramgarh was the first district in the state to get the ODF tag and presently 14 of its 24 districts are free from open defecation. The remaining ten are undergoing a third-party verification by the Quality Council of India. Previous Post: Swachh Warriors of Jharkhand. Next Post: Closing the loop with Saahas Zero Waste.